Our week at Fulham Palace started warm but not the boiling heat we have had over the last few weeks. Some days we even needed a jumper! The children enjoyed using ropes to make traps and climbing frames in the nest. These became more and more elaborate as the week progressed, challenging their climbing skills and imaginations. The educators were very impressed with the children’s rope skills and knot tying. A fallen wasps’ nest on Tuesday meant temporarily moving base camp for the day – it was impressive to see how adaptable the children were to this unexpected change. We put up two paper bags to ward off the wasps. 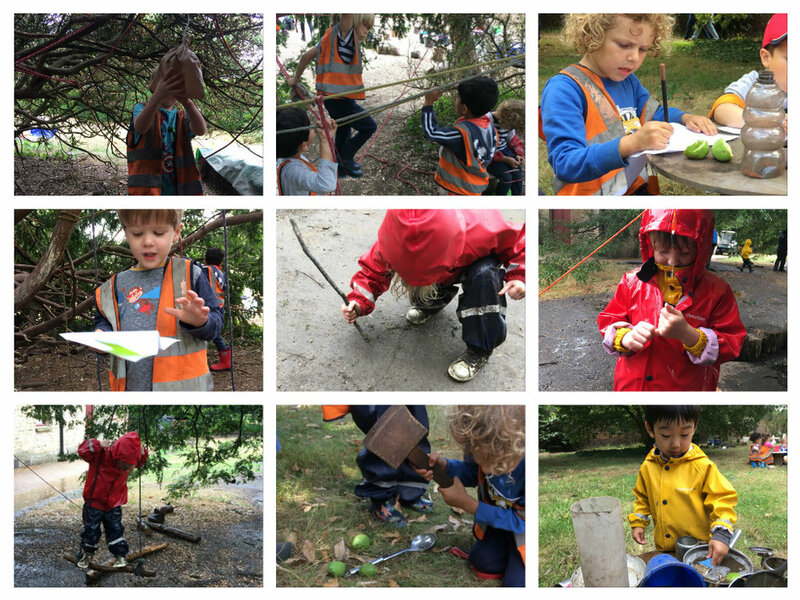 The children were very observant and soon after arriving in the forest started asking questions about the paper bags. We explained to the children how the bags help to keep wasps away as wasps think the paper bags are rival wasps’ nests and they do not want conflict with another hive. It was great to see the children confidently explain this to others the next day when they saw the paper bags hanging in the trees. On Thursday, the paper bags had not been hung and the children asked if we could put them up to make sure wasps didn’t come back! The new base camp provided an opportunity to explore a different area and observe some vegetation we haven’t seen before, including a quince bush. The children discussed the plant, described the spiky texture and collected some of the fallen fruit. The children used a mallet to smash open the fruit and discover what was inside – lots and lots of seeds! Some children took the seeds to plant more quince bush. Other children experimented with putting the seeds in water and discovered they sank! This lead to further discussion and experimentation on the buoyancy of various objects and children extended their own knowledge and understanding by testing leaves, sticks, quince, quince seeds, tomatoes, apple peal and biscuits. The downpour of rain on Thursday created the perfect setting for ‘going on a bear hunt’. It was lovely to see the whole group of children engage with this together. Half pretended to be bears hiding and the others went on an adventure through long wavy grass, a very deep river (puddle), thick oozy mud and a dark forest before been chased by the bears and then swapping over. After the rain eventually stopped it was interesting to see that the mud had become smooth and was a perfect canvas for drawing on. 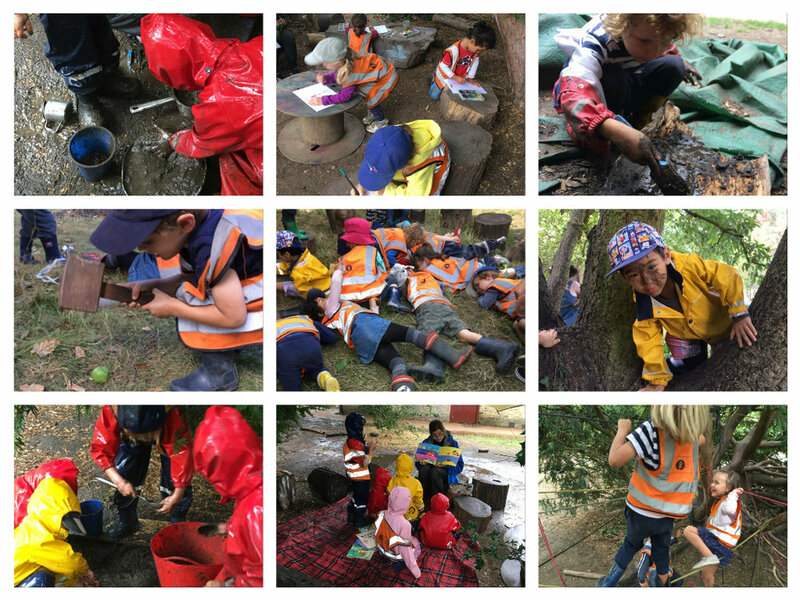 A group of children played Pictionary in the mud, drawing pictures whilst their friends tried to guess what the picture was. The drawers gave clues if their friends couldn’t guess. It was interesting hearing children guessing and asking for clues. Some of the clues were very intriguing “it’s what famous people do”, “when they do it they draw” and “you learn it at school” …. Can you guess what it is yet? A piano of course!